The medium cabin is smaller than the big cabin, but not lacking in comfort or amenities. This cabin was originally the kitchen and laundry room for our campgrounds’ general store and now it is a better kitchen (with full-sized appliances), a good sized bedroom, a bathroom and shower closet; and all the rest that you would expect like pots and pans and dishes and a flat screen tv with satellite. The medium cabin is a great for a single, a couple or a small family. It sleeps up to 4 on 1 king bed in bedroom and 2 full sized roll-a-way beds. The cabin is a great alternative to a hotel room and has a small deck outside of the front door. 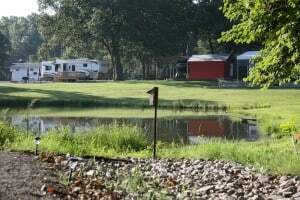 While the cabin is near our fishing pond, the cabin is tucked behind two permanent campsites so there are no views unfortunately. If you are looking for views, this might not be your best option. If you are looking for a really clean and affordable cabin near the lake, this might be a perfect option. Number of overnight guests is strictly limited to 4, unless otherwise authorized.